It's no surprise that Abzan is the most played deck in the Modern portion of Pro Tour Fate Reforged. The deck is very clearly the most popular strategy in the wake of the banning of Dig Through Time, Treasure Cruise, and Birthing Pod. Not all Abzan decks are cut of the same cloth, though. Some versions of the deck are streamlined piles of four-ofs, while others have access to cards that over-perform in specific situations at the expense of consistency. There are aggressive versions, traditionally midrange, and others tuned to have an edge in the mirror. Let's discuss the many flavors of Abzan that showed up this week with some of the players that brought them to war. Nearly all the Abzan decks we're seeing this weekend include some number of Tarmogoyf, Thoughtseize, Inquistion of Kozilek, Abrupt Decay, Lingering Souls, Liliana of the Veil, and Siege Rhino. From there, things are up in the air. The remainder of the deck largely depends on one's expectations for the metagame. Joel Larsson and the rest of the Danish/Swedish collaborators are playing a proactive version of the deck with Dark Confidant and Voice of Resurgence. Larsson asserts that the more streamlined/proactive version of the deck gets better use of the sideboard. Voice of Resurgence is very good against the current field and especially strong against opposing copies of Liliana of the Veil. Most lists we're seeing this weekend have some number of Tasigur, the Golden Fang in their main deck, but Larsson's version instead chooses to put the Fate Reforged legend in the sideboard. Gold-level Pro Joel Larsson and his collaborators settled on moving their copies of Tasigur, the Golden Fang to the sideboard. Tasigur, the Golden Fang comes in for the second and third games a big portion of the time, basically whenever the opposing deck isn't a hyper aggressive entity such as Burn. Tasigur, the Golden Fang is better post-board because the mean value of an individual card improves after sideboarding. When the deck is in its post-board configuration, there are no good options for the opponent when they're dealing with a Tasigur activation. Jon Stern and Team Face to Face brought a hyper aggressive version of the deck that includes cards like Loxodon Smiter, Kitchen Finks, Gavony Township, and Wilt-Leaf Liege instead of staples like Liliana of the Veil. Stern knew they wanted four copies of Lingering Souls as their first three-mana spell, but the next slot was a toss-up between Kitchen Finks, Loxodon Smiter, and Knight of the Reliquary. 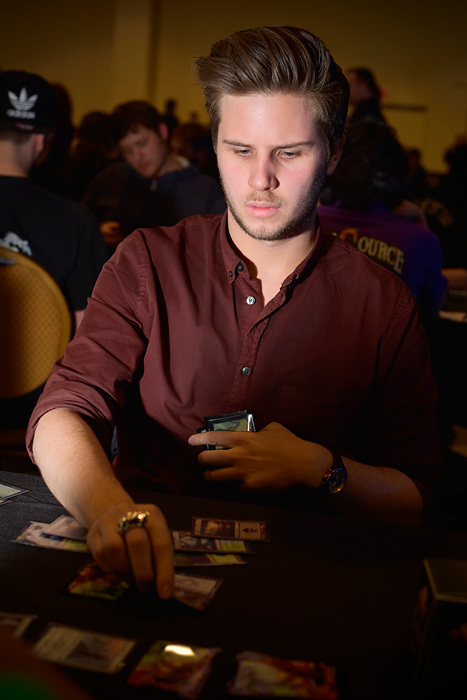 Finks was the strongest choice against Burn and Zoo opponents. Loxodon Smiter provided a fast clock to beat the combo decks while also being strong against Liliana of the Veil and other discard effects. Knight of the Reliquary offered up the most versatility. Eventually, they decided on a 4/2 split between Loxodon Smiter and Kitchen Finks, most players favoring Smiter in the split. Gavony Township is a huge factor in the mirror match, which usually comes down to a Lingering Souls war by making their tokens bigger, Stern is able to break stalemates beautifully. Thoughtseize was initially in their sideboard, and the team knew they wanted access to four copies. Sideboard slots were extremely valuable (as they tend to be in Modern) and the combo match-ups were pretty bad. As a result, they decided to play two copies of Thoughtseize main to give their sideboard more room for improvement and give them a bit more breathing room to beat the combo decks by applying a fast clock with disruption. Liliana of the Veil is embarrassingly bad against Stern's version of the deck, which seems like a huge selling point after this weekend Abzan turnout. Platinum Pro, two-time Pro Tour Top 8 competitor, 2014 World Championship Top 4 competitor, and sixteenth-ranked player Kentaro Yamamoto is playing another version of Abzan that features a full four copies of many of the cards that one might expect to only see two or three copies of. Sixteenth-ranked Kentaro Yamamoto's Abzan deck includes some tech to shore up a rough Burn and combo match-up. 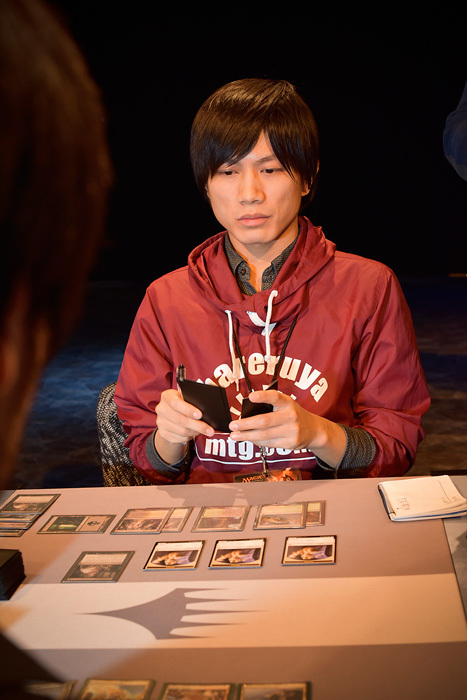 Yamamoto proudly displayed the eight targeted discard spells, four copies of Tasigur, the Golden Fang, and four copies of Path to Exile that differentiate his main deck from the rest of the field. He believes his deck performs well in the mirror because of Path to Exile and Lingering Souls. Eight discard spells increase the odds that Yamamoto will be able to play a piece of disruption on the first turn and follow it up with Tarmogoyf or Voice of Resurgence while also decreasing the cost of Tasigur, the Golden Fang. Postboard, Yamamoto has access to Chalice of the Void to make his combo and burn match-ups a breeze. Simply put, this version of the deck plays more copies of the most powerful cards, and there's a lot to be said for that in a format with this much disruption. We've only scratched the surface of the plethora of Abzan strategies we've seen show up this weekend. Which versions of the deck will rise to the top of the competition?